Kidding had been a breeze so far this year. Every goat kidded quickly and easily - until Luki. As Luki's due date approached I began making more frequent checks on her. As a goat gets close to her time her udder will get fuller and the kids will drop into position. These things can happen several weeks before delivery. Then I watch for loss of the mucus plug and loosening of tail ligaments. These things usually indicate we're a matter of days away. The first stage of labor is mild contractions which really aren't that noticeable, so I look for a change of behavior in the doe as a clue. Sometimes she'll go off by herself. Sometimes she gets spaced out like she's concentrating on something going on inside. Some paw the ground like they're making a nest. Some will lay down and look at their bellies as if wondering what's going on. When I see blood-tinged discharge, however, I know the show is about to begin. Luki's only clue was that she was more talkative. I didn't catch that at the time, but thankfully I was checking often anyway. Going on chore time I headed out to the girls' shed and found her standing outside with a baby goat head sticking out of her rear end! Yikes! Kids are usually born feet first with a nose soon to follow. The delivery of an entire head without feet could only mean that the legs were bent and hung up somehow. The first thing I did was to wipe the birth sac away from the baby's nose with my skirt. It sputtered and gasped which was a huge relief. I dragged Luki into the birthing stall and started trying to find feet. It was a tight fit and Luki hollered, but I finally managed to find the right front foot and pull it out. I couldn't find the other foot so I gently pulled on what I had and the baby slipped right out--a little girl. Baby Girl didn't move at first so I massaged her vigorously with a towel until she roused. She remained lethargic and slow trying to get up, so I gave her a newborn dose of Nutri-Drench. Nutri-Drench is like an instant energy drink for goats or sheep, loaded with vitamins and electrolytes which assimilate quickly. I keep it as part of my kidding kit. Soon Baby Girl was up and and getting her tummy full of colostrum. Within a few hours she was doing a pretty good job of trying to bounce around the kidding stall. Luki was my last doe to kid, so our kidding season is officially over for the year. My final total is six girls and two boys. Not bad, huh? well done on your quick response, congratulations on getting to the end of another kidding year. I love the colour of all your goats and kids, whether dark or light. And glad this became yet another success story. Good interventions and glad you were there to help. I'd feel pretty chuffed to only have to rehome, keep or eat 2 boys for the breeding season, instead of more. Girls are so much easier to rehome or keep. I'm not so keen on eating girls (although in my case, its hens). Regarding all the girls, I tired an experiment this year. 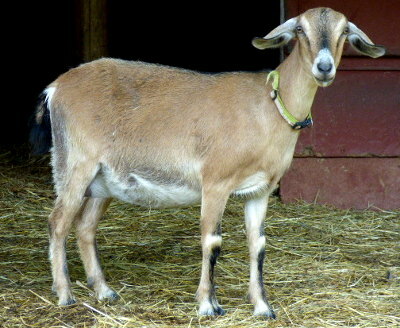 I read that breeding goats early in their estrous cycle produces more males, later, more females. The mother of the boys was put with the buck at the first sign of heat. For all the others I waited until their 2nd day (goats usually seem to show a 2-day heat). So in this experiment it worked - almost. I sold a doe last fall and was asked to breed her first. She went in with the buck at her first sign of heat and had quadruplet girls. So who knows! It's definitely easier to sell the girls, which is nice because there are always extra bucks for chevon. Only once have we processed a female for meat, because she broke a shoulder that couldn't be set to heal properly. The bucks are promising, however, so I'll keep one to breed and will probably be able to sell the other. A great read, and again informative. Thanks. Wow. I'd call her Lucky Luki, what with having you right there with your midwife skills. Glad the birth turned out well for all parties. Love the nuzzling in the last pick. She is so cute Leigh. Glad everything worked out. A concern I had about Luki was that she'd been rejected by her own mother and therefore bottle raised. I wondered if she'd take to mothering, and she has. She's a great mom. What a pretty mother-daughter pair; perfect for Mother's Day. :-) Glad you were there to intervene. I'd LOVE a ewe/ram ratio like that! I don't have any experience with birthing goats but it sounds remarkably the same as pigs which I have a lot of experience in. It's always a relief to get done with birthing season! I had the same birthing experience this year with my Pippa. Doeling presented head first, and I was only able to get one leg forward. Luckily I was able to pull her like that, but the baby had a very rough start. She is a big healthy girl now though. Crazy goats always keep you on your toes. Glad to see it all worked out okay. Yes, indeed! You know this with sheep, but it always pays to be on hand when due dates approach. I'm just glad this was the only incident for the year. Kelsee, interesting! So glad your situation worked out well. It must be a rough way to be born, because Luki's little girl takes frequent long naps in between rounds of bouncing around. All's well that ends well. The baby is so cute. I love her ears. Not bad at all! Very well done, another beautiful baby goat!!! Your kids are so cute. Almost caricatures of kids. Congrats on the doe year. We split 50/50 at our farm. Those are trademark Kinder ears! Do you still have goats, Jaime? I'm really bad at keeping up with blog reading these days! It usually seems to go one way or the other. :) I think this is the first time I've gotten so many does. well real snow isn't all that white either. ;) What about Maisy? I read posts about birthing with such interest. My fear of missing something important keeps me with just a She Farm. Now that my goats are two full years old, they don't look like micro-Nigerians anymore. Maybe this fall would be good. I think the market is stronger for cute blue eyed goats rather than 175 pound sheep. If it was for keeping, then I would go for sheep. I guess I'm not ready yet. Several year's ago I had a Daisy May, and I'm thinking about reusing that one. A lot of it depends on personality, though, which can take some time. I find I have trouble keeping their names straight anyway, even the one's I've had for awhile! Good job on the kidding! You are building quite a herd this kidding season. Interesting thing that Nutri-Drench. Glad it did the trick. Local vet used to recommend a tablespoon of whisky for slow responding calves. Oddly enough, it worked pretty well. A little snorting and head-shaking (I can identify with that! ), and they were usually on their feet and nursing in a minute or two. So glad everything worked out! Also, that may be the cutest baby goat I've ever seen. Pigs are sneaky that way. I probably saw about 5% of sows giving birth (usually only new mothers) and usually only part of each litter unless there were problems. But with 120 sows, that came out to a lot of pigs over the years!